I'm having a bit of an annoying issue. at my work I often have to edit files where I don't have the font on my computer and that's fine, I usually find the font, install it, and it's fine. However, there are some fonts that, even after I change them, the "missing font" with the diamond next to the name remains in my list of fonts, so even if I open up a new file, those fonts are listed with the diamond next to them, and appear as the pink highlighted text. Is there a way to remove those fonts from the dropdown list of fonts? it's really annoying when I'm going through them and I have a bunch that are not useable. I've attached a screenshot of what I mean with red lines next to the fonts in question. In the file in the screenshot, it's a new file I'm working on where I'm NOT using any of those fonts, so why are they listed? It's so annoying and I just want them to be removed. I understand showing them when I have a file open that contains missing fonts, but not when I'm working on a file that doesn't contain them. Edit: I'm on a mac, should have mentioned that to start, sorry! This may be worth a try: Open the offending document and Go to the Menubar > Type > Find Font. 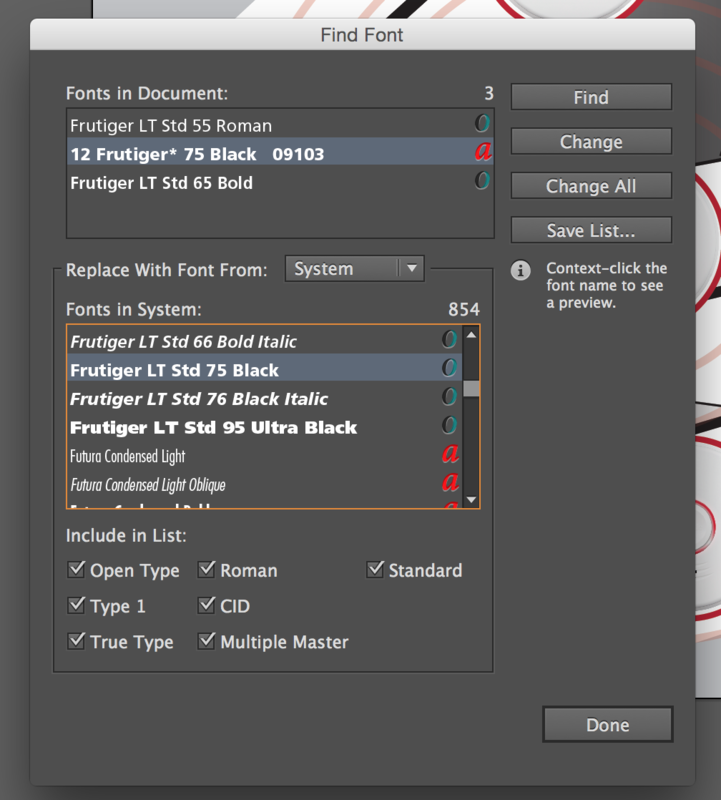 Then click the missing font and choose a font from your System that you know that you have. 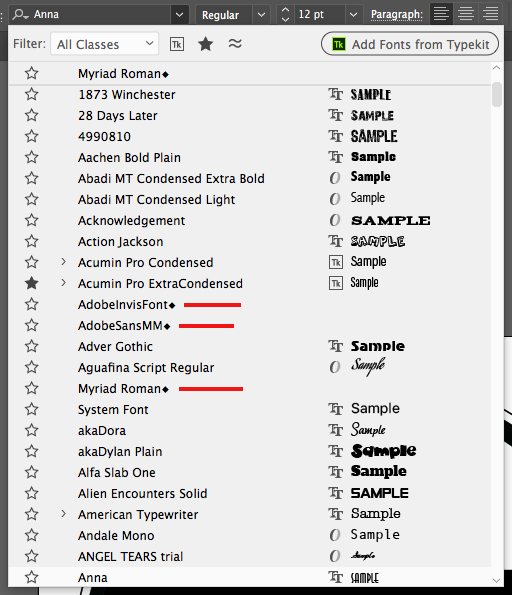 Select Change All, until you no longer have any missing fonts in the document. Hopefully it will clear whatever cache that is causing it to show on the font list. Have you tried resetting the application's preferences? Just hold Option+Command+Shift as you start Illustrator. Also, trying something like: Font Cache Cleaner or FontNuke might help. It cleans up any corrupted fonts from your computer's different caches. The issue comes from opening up a file(s) that are missing fonts according to your system. I get this most often when I have say Helvetica Neue Roman being called out when I have Helvetica Neue Roman 55 on my system. Fonts are finicky like that where they need the EXACT naming convention to successfully link. This is avoided by correctly replacing all fonts on opening the document. You have these "artifacts" because at some point you opened a document and didn't correctly relink all missing fonts to a replacement.